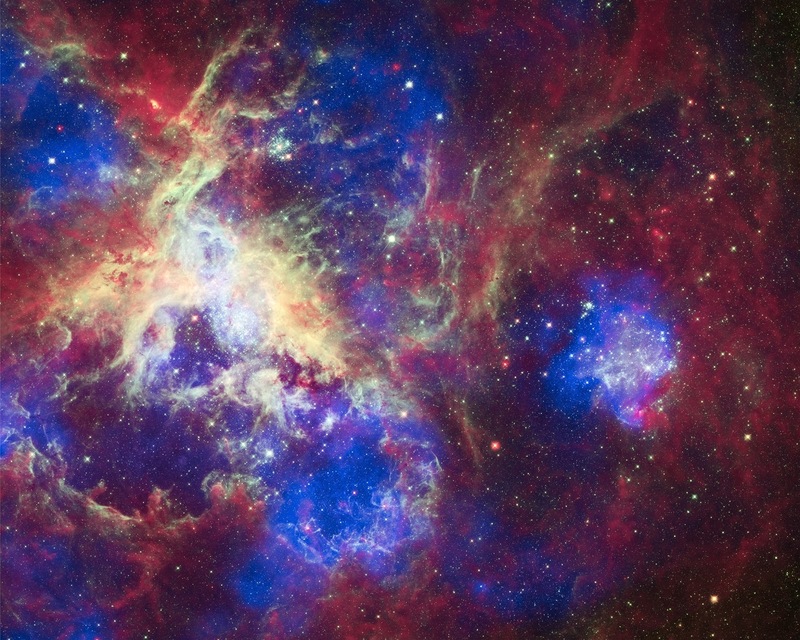 This composite of 30 Doradus, aka the Tarantula Nebula, contains data from Chandra (blue), Hubble (green), and Spitzer (red). Located in the Large Magellanic Cloud, the Tarantula Nebula is one of the largest star-forming regions close to the Milky Way. Chandra's X-rays detect gas that has been heated to millions of degrees by stellar winds and supernovas. This high-energy stellar activity creates shock fronts, which are similar to sonic booms. Hubble reveals the light from massive stars at various stages of star birth, while Spitzer shows where the relatively cooler gas and dust lie. Image Credit: X-ray: NASA/CXC/PSU/L.Townsley et al. ; Optical: NASA/STScI; Infrared: NASA/JPL/PSU/L.Townsley et al.